Bright And Sunny Self Catering, Child Friendly Holiday Accommodation. Family friendly close to amenities, set in 2 acres in the countryside. Gite and B&B accommodation built in Charentais stone set in 2 acres with safe and secure gounds and surrounded by sunflower and cornfields. With a 16' salt water splash pool we are child friendly with swings, slide and 15' netted trampoline. Perfect for families, couples or singles. Our gite has been renovated with lots of character but also has modern comforts at prices that are affordable. 5 mins to all amenites including shops, banks, cafes and supermarkets. Within 10 minutes you'll come to the Charente river for swimming or to the Villefagnan leisure lake and beach. The RN10 is easily accessible, airports are 25 and 50 minutes away and the TGV stops at Ruffec. Enjoy the sun, the beautiful scenery and visit the theme and wildlife parks, pretty towns and churches. In the gite, for the children, we also have a dolls house, Playmobile farm and Play Kitchen. My name is Liane. I live with my husband Paul, we have 2 children, Ciar who is 19 and Aston 15. We have lived in France for 11 years, It's been fun, but frustrating at times. It took us just over 6 months to find a property to buy. Our first criteria was 'NO renovation' so ended up with a total renovation! It took us 3 months to renovate the gite which we ended up living in until the main house was finished which took another 6 months, just in time for our first visitors which were, fortunately, our family. We decided to rent the smaller portion of the house out as a gite because my mother-in-law, who was meant to come and live with us, changed her mind. So, rooms were going spare. We have been running out Gite/B&B since 2009 and have had lots of lovely people stay and are happy to say they have all enjoyed their holiday here. Only indoor towels are provided, guests are to provide pool towels. Large, open plan, well equipped kitchen with fridge/freezer, gas cooker with 4-ring gas hob and oven, washing machine, microwave, kettle, toaster plus all crockery etc. Available to hire at Le Rejellant, 3 miles away. Tennis court is available near the Church free of charge. Please see the link on our website for details. Babysitting is available on request, please contact us for more details. I arrived very late with my 11 year old son as a co-pilot. Not haven driven in France for some 8 years i relied on Liane's directions and then her guidance over the phone on the last leg along the dark country lanes. The gite was cosy and welcoming with a basket full of logs ready for the fire and food in the fridge for breakfast the next morning. Paul baked some fresh croissants the following morning that my son collected and shared with the little cat. The gite was in a perfect location for visiting my eldest son who attends the local college in ruffec. Liane was very helpful in offering ideas for teenagers in France having brought up her own children over there. The gite itself was just perfect with each bedroom offering en-suite facilities fresh clean bed linen and towels. The sun shone and there was a real sun trap round the back of the gite, I was offered a sun lounger and large umbrella as I lay basking in the sunshine whilst watching my son go on the trampoline located in the barn opposite. Both Paul and Liane have extensive knowledge of the local area and where the best offers are; in particularly the best value wines!!! I was unfortunate to be caught up in the french air traffic control strike whereby my flight was cancelled. Paul and Liane worked round their bookings and were able to offer me two out of the 4 extended nights that I had to stay until I could catch a flight home, even offering the use of their computer and printer so I could rebook new flights and print off our boarding passes. In summary: clean,cosy comfortable stay with friendly flexible owners...... Thanks guys. It was a very relaxing stay in quiet off the beaten track Gite. The owners were very friendly but not intrusive. Our children played with their two children though they did not encroach on our stay. the rooms were clean , bright and modern, done to a high speck in the shower rooms and all the necessary storage etc. anyone would require on holiday. There was a lovely area nearby with a river and canoeing facilities, for tourists to easily partake in . There were ample shops nearby by car or a bike ride to the local bakery etc. Liane and Paul, our hosts, were very knowledgeable and would help with anything we needed to know. I suggest you ask them to fill you in with all the handy hints anyone of French life and the way things go. 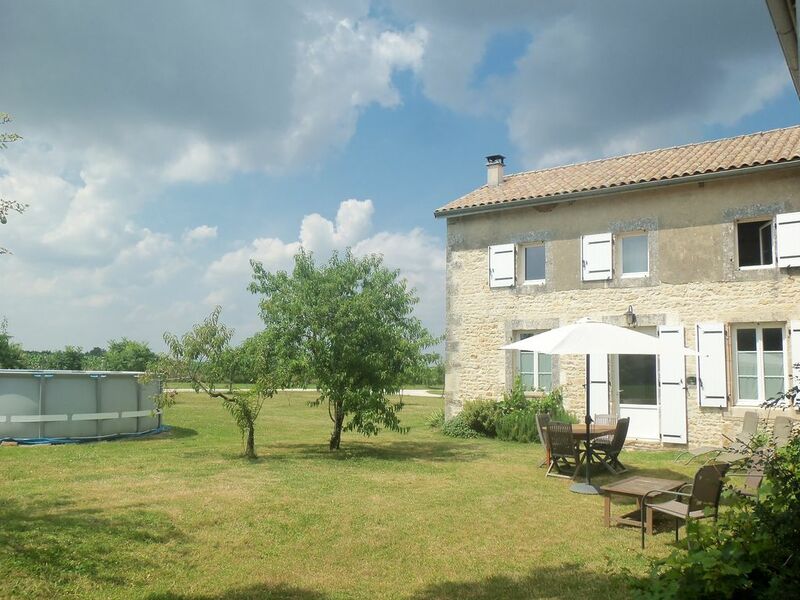 Rest, space, a pool and a luxurious gite in the beautiful landscape of the Charente. That's what we were looking for when we searched for a place to spend our summer holidays. And we found it in Ruffec: at the Jacksons. The gite is really pretty with a lot of space for our family of five. A large kitchen with all facilities, a cosy living room with TV and DVD-player. Because of the tropical temperatures we didn't use the TV much. Despite of the heat the house stayed quite cool thanks to the thick walls. The three girls fitted perfectly in the bedroom and had their own toilet and bathroom. For my wife and I there was a spacious bedroom with a king size bed and also our own bathroom. Because of the heat the pool was a real treat. The children used it every day while we were sitting in the shade of the cherry trees which gave shadows and delicious fruit at the same time. Ruffec is a nice city and offers the nearest boulangerie and supermarkets. A nice place to cool off is the Rejallant in Ruffec where you can walk and swim in the Charente-river or just finish that novel you're reading. We also rented tow kajaks for a two hour adventure to Barro. Quite an adventure but beware of the small waterfalls though! Of course we went for some trips: to Angouleme, Vallée de Singes (a real succes for the children to see monkey's up close), Verteuil and Nanteuil. In Nanteuil we stopped for a delicate lunch at Auberge St. Jean where they offer a special menu for the afternoon for only 15 euro's, a bottle of wine included. The location, close to the church, is really superb. As was the food! All in all we spent a real super holiday in the Charentegite. Liane and her family are very hospitable people and always prepared to give you more information. Or a glass of Pinneau. The girls had some fabulous hours in the pool with Aston. They even speak quite a few English words now. Our holiday ended literally with a real bang. A severe storm with thunder and lightning shook the house the last night of our stay. The result was a sad panorama of damaged trees in the garden when we woke up. We hope everything is restored properly 'cause we grant this gite to everyone who's looking for the concepts mentioned in the first line. Fabulous river and lake beaches are between 5 mins away at Le Rejallant in Ruffec, Villefagnan and Sauze Vaussais. 10 minutes drive, at Taizie Aizie is an activity centre where you can Accrobranche. The Vallée des Singes is about a 20 minute drive which is very popular with the children as well as Futuroscope in Poitiers. We are easy to get by road and rail. Plenty of cheap flights to Poitiers (50 mins), Limoges (90 mins), Bordeaux (120 mins) and La Rochelle (120 mins). All have car hire. The nearest ferry ports are at Caen (5 hrs) and St Malo, Calais, Boulogne or Dieppe and the Channel Tunnel (approx 7 hrs). The TGV also stops at Ruffec! Ruffec centre is only 3 miles away with a variety of shops and restaurants, market days are Wednesday and Saturday. Angouleme centre is 25 minutes, Poitiers 50 minutes. Having children of our own we have investigated a lot of the theme and nature parks, plus activity centres. All details can be found on our website and at the gite. We have 2 acres to run around in. A large orchard full of plum, cherry and walnut trees, great for a shady spot on hotter days. We grow a lot of our own vegetables, herbs and salad and, all going well, are available for your use as well as any fruits that have ripened. Listen to the crickets and cicades and just relax. If you have children watch them run riot and wear themselves out on the trampoline (which is undercover so is suitable for use in all weathers) and in the splash pool. Booking Notes: 30% booking deposit is required to secure a booking. Payment for the remainder 6 weeks before arrival. Security deposit cheque of 150 GBP to be given on arrival and returned on departure. Changeover Day: Flexible, we know how difficult and costly it is to book weekend flights and ferries so we are happy to accept bookings on any day of the week. Notes on prices: For stays over 2 weeks please contact us to discuss a discount! During school holidays (apart from between July and August) the price is £350 per week.